Donkeys should receive the same injections as horses, but the annual shots required depend on your region and prevalent diseases. Equine vaccines are designed for horses, but your vet can use them for donkeys, too. The American Association of Equine Practitioners notes that data is limited regarding the use of vaccines in other equids, such as donkeys, so "vaccination of these animals is at the discretion of the attending veterinarian." The AAEP identifies several vaccines as "core," meaning they protect against diseases that are endemic to an area, highly infectious or have public health consequences. The recommended core vaccinations include rabies, tetanus, eastern and western equine encephalomyelitis and West Nile virus. If your donkey contracts any of these diseases, the outcome is likely to be fatal. If he contracts rabies after being bitten by a rabid wild animal, he could pass the disease to you. Besides the core vaccinations, there are others shots you might want to give your donkey depending on your part of the country and your donkey's lifestyle. The AAEP refers to these as risk-based vaccines, as you must weigh the risks of your donkey contracting the disease against the vaccine's benefits. 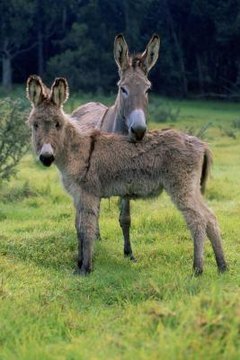 If you keep your donkey in your backyard with another donkey or equine companion and none of them leave the premises, your risks are much lower than if he's kept at a stable where horses come and go all the time. As a general rule, if you vaccinate your horse against a certain disease, also vaccinate your donkey. Non-core vaccines include equine influenza; rhinopneumonitis, also known as equine herpesvirus; botulism; Potomac horse fever; strangles and equine viral arteritis. The latter is a vaccine you might consider if you intend to breed your donkey. Ask your vet about whether or not she recommends a non-core vaccine in your particular case. Some vaccines, such as Potomac horse fever, might not prevent your animal from coming down with the disease but can lessen the severity of symptoms. Since equine vaccines aren't manufactured with donkeys in mind, the amount given to a donkey is left to the vet's discretion. In "Herd Health for Donkeys," Dr. Stephen R. Purdy writes that, while some owners and vets suggest that smaller equines should be vaccinated with reduced doses of standard equine vaccines, he does not believe in this practice. He cites a lack of scientific evidence and the possibility that a lower dose might not stimulate the donkey's immune system sufficiently to provide a protective response. Purdey also notes that young foals and draft horses receive the same amount of vaccine, so there's no reason to give a donkey a lesser amount.